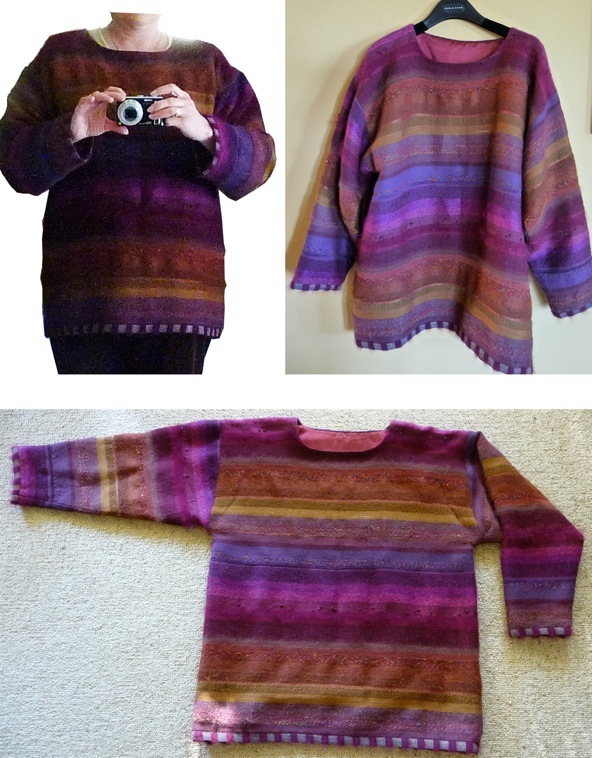 My husband gave me this beautiful mohair top a number of years ago. I am hoping that we have some great designer minds amongst our readers who could provide suggestions on what to do with this treasured item. Due to its firm silk lining and more or less straight cut it is uncomfortable to wear. I love the colours and textures of the yarns used in the weave and the immaculate workmanship which prevented me from cutting into it or throwing it out. Something has to happen now, I really would like to wear it, and this is where I am stuck! The neckline is too wide at the shoulder, whatever I wear underneath is showing. So far I have worn a scarf to cover up, but it is actually quite a warm top and times to wear it like this do not occur often. This lead to the idea to cut the front and make a jacket. But, what do I do with the neckline then? It still needs something, does it call for a collar? How do I continue down the front to tie everything together? Let me know if you have any ideas which could come to the rescue! Take it apart and put it back together as a patchwork blanket or throw - add some patchwork fabric quarters to it - it'd be fabulous for cosy winter nights by the fire! Jacket, jacket, jacket - although the 'how to' alludes me! Make a jacket. Use a raw/matt silk or similar fabric in one of the colours to make an edge/facing as per a dressing gown. This way you can fill in the neck line. you could also create some ease by opening up the side seams about 20cm or so. 1. Patchwork throw is a great idea. 2. there is too much work involved to create a Jacket out of what you have. If you want to carry on weraing it, you will have to combine it with another fabric to change the shape. 3) Cut the lining out if it restricts movement. Trim a small amount off the hem to make a neckpiece/collar. Add a knitted fabric to the hem to draw it in like a sweater does. Attach the trim fabric to neck or add same fabric as hem to make neckband. Hi and thanks to all who have commented so far! Mel, Barbara and Jill, complimentary fabric like raw silk (I imagine an iridescent one in two colours matching the yarns) or a knitted fabric sounds great, also opening up the sides is a good idea. I think I will first cut the lining to see how the seams are done, buy some matching fabric and use the beautiful bands on sleeves and seam to tie everything together. I am getting quite excited now!